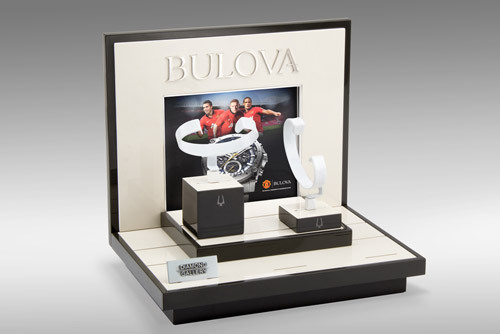 PN designed and manufactured an in-case and window display program to meet Bulova’s needs for an international market, with some modifications for specific markets such as Japan. All aspects of the displays, including graphics, were handled by PN. PN became involved in the Bulova Brand Relaunch in fall 2012, a project which rolled out over a year later in early 2014. The task was to redefine the brand image in visual merchandising to reflect changes in brand identity and corporate direction. The client’s initial specifications were for a strong color focus to make the brand feel more modern, accompanied by an interest in basic materials. As the project progressed, the vision evolved to become more complex. 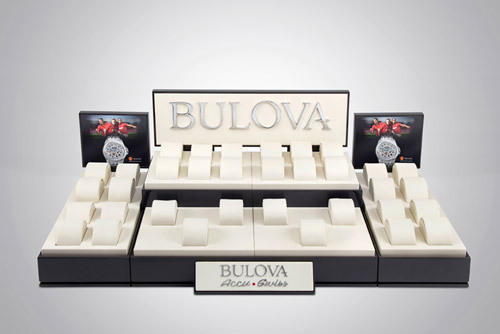 The goal was for each of the brands owned by Bulova to have their own unique brand identity, yet still suggest a strong connection to each other and Bulova. To solve this design challenge, PN created distinct color stories for each brand and incorporated subtle connections between them to evoke unity. The project also expanded to include the relaunch of Accutron as Bulova Accutron II and Accu-Swiss, maintaining Bulova as the brands’ anchor. Additionally, special versions of the program were developed for Japanese and European markets. The final product was sleek, simple, and clean, conveying the modern aesthetic the client had wanted. 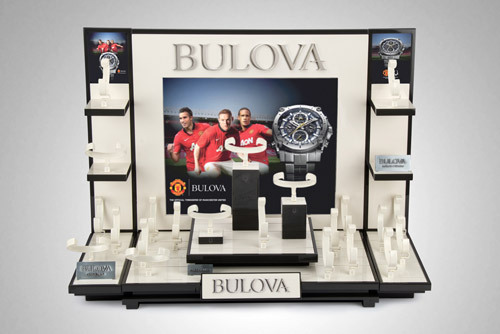 Through design and creative insight as well as color and materials development, PN helped Bulova develop a world-wide visual merchandising program. PN was proud to be involved in such an important part of the iconic brand’s history and evolution.